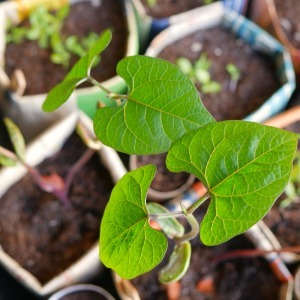 There are lots of different options out there to raise seedlings and to be honest, I think I’ve tried them all. 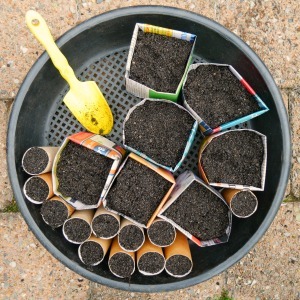 You can use egg cartons, toilet rolls, existing seedling containers or even recycle some of your containers from the kitchen. The thing I like the most about this paper pot is that you don’t need any staples, glue, tape or even origami skills to make them. In fact, my 9-year-old was loving the challenge and made a stack of awesome pots for us to use. A great kids activity for a rainy day. 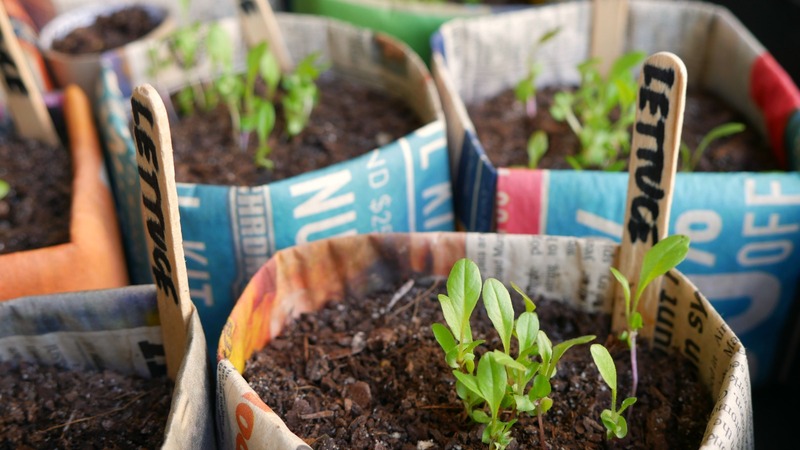 Want a sustainable way to raise your seeds? Perfect for a kids activity on a rainy day. 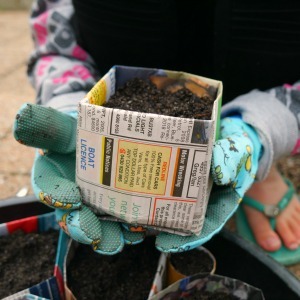 Plant your pot with your seedling and reduce waste. 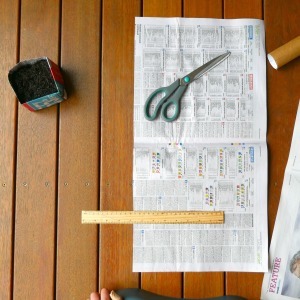 Cut 10 cm (approx) off the side of your sheet of newspaper. Newspaper sizes vary, so aim for a square shape on the first fold. Fold in half (top to bottom) and half again (sideways). Open up the last fold then take the top 2 outer corners and fold them in to the centre crease. From the bottom, fold one side of the newspaper upwards to meet the previous fold, and then repeat this action again with a 2nd fold upwards. Flip over your origami pot and fold both outer sides to meet at the centre crease. From the bottom, fold upwards twice. Once to meet the bottom of the pot, then a 2nd time to fold back on itself. Unfold the last fold and take the bottom edge and fold it inside the space. Now you should have a pocket. This is the trickiest step but just take your time and it will fold in flat. Take the tip of the triangle at the top and fold it down to meet the edge of the opening to the pocket and press down to make a crease. Repeat this on the other side. Staying on this side, take the tip of the triangle and fold it down on the right-hand side to meet the start of the square shape. Press down on both sides to form creases (see video demo). Keeping the right-hand side to the top, open up the fold and use your hand to gently open the box shape. Fold the triangle down flat to form the base of your origami pot. Crease all 4 lines to make the square of your origami box. Next, fill with seed raising mix and place into trays. Seeds need enough room to grow upwards towards the light so ensure you use the correct mix and don’t press the soil down. Keep it nice and light. Sow your seeds as per the instructions. We planted the Spring Friendly Collection from Thow Some Seeds which contained tomatoes, lettuce, climbing beans, chives and capsicum. It’s an awesome self-sufficiency pack and you’ll get plenty of produce from this mix. You’ll need to water in your seeds and keep them damp. The trick with these pots is to not move them until they are ready to go into your food garden. Lightly water them with a spray bottle and ensure you don’t drench them. *NOTE: Newspaper will deteriorate if you soak it in water, so don’t overwater your pots. The other thing to avoid is handling the pots. Simply place in tray once full of soil and don’t remove again until they are ready to go into your food garden. 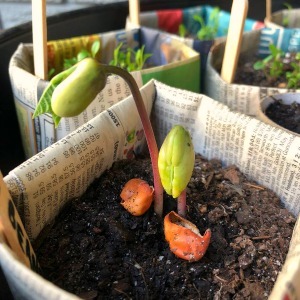 One of the benefits of the origami seed raising pots is that when your seedlings are ready to go into your food garden the pots can go with them. This means the roots of your seedlings won’t get disturbed and the newspaper will break down over time. An awesome sustainable solution. Want to grow food at home with your family but don’t know where to start? Come and join our Facebook group – Our Food Garden.